Until we heard a missionary couple (now friends) from our home church in 2008 share about “Support Roles”, we didn’t know we could use our cumulative job skills and experience to support Bible Translation. Now we’re here in Papua New Guinea (that country north of Australia, and east of Indonesia) where Todd is serving as the Senior Manager for Centre Services (which oversees the Clinic, Guest House, Post Office, Print Shop, Shipping and the Store departments) in Ukarumpa (ooh-kuh-rum-puh), a missionary community of about 600 people involved in Bible Translation. Cathy is involved in teaching in an Educational Learning Specialist capacity, helping students successfully traverse obstacles in their learning process. This multicultural community consists of well over a dozen different nationalities all geared together for the purpose of supporting and furthering Bible Translation in PNG, the most ethno-linguistically diverse country in the world (nearly 12% of the world’s total languages reside in this country which is just the geographical size of California)! We would love for you to partner with us from right where you are. We continually need prayer partners and financial supporters. We are so thankful for those who are–and have–partnered with us in eradicating bible poverty. YOU make it happen and, please know, YOU ARE valued! It is possible we can see in our lifetime every language in the world with the bible translated into their mother tongue! Whoa! Every tribe, tongue, & nation…encompassing nearly 7,000 languages around the globe–wow! Let’s get the job done. Let’s eradicate bible poverty…together. Wait, what exactly are you doing in Papua New Guinea (PNG) again? As part of SIL-PNG (Wycliffe in PNG) we are part of a support community for the work of Bible translation in PNG. We are part of a faith-based organization staffed by volunteer workers from nineteen countries (October 2015 statistic). These volunteers, of which we are a part, are supported and sponsored by churches and individuals in their home countries who are also committed to seeing “Papua New Guinea Empowered by the Written Word”. SIL-PNG provides training in linguistic analysis, translation skills and literacy development as well as formal and “on the job” training in various skills and disciplines. SIL-PNG also provides logistical support in order to further the work of Bible translation and language development throughout Papua New Guinea. As a Store Manager, Todd helps to oversee and ensure that all expat and Papua New Guinean Staff that live, work and engage within the Bible translation center/hub known as Ukarumpa have the resources and personal supplies they need to do what God has called them to. As an educator, Cathy help’s student’s reach their full potential by learning and growing in the classroom and, in turn, the world they live in. See us at work in our ‘Bridges’ video here. What does it mean when you say you need “pledged monthly partners” or “monthly pledged partnership” or “support”? The bare bones of most overseas missionaries is that they need donated financial support (i.e. money from ‘partners’, etc.) to allow them to go and do what they do. Non-Profit Organizations (NPOs), and to a lesser degree even some Non-Government Organizations (NGOs), don’t exist and function out of a profit-based model whereby they can afford to pay personnel for the work being done; as such, they completely require the generosity of those who are called to give as God directs them to. In short, that our ministry be “self-funded”, “self-supported”. This is our situation. We have a set amount of funds we need monthly (as dictated by our sending organization). In base terms and for sample purposes only, if we needed $100 to live & operate in PNG on a monthly basis (we need more than that in reality, by-the-way), being at 84% would mean we have partners who have committed to giving $84 on a monthly basis (some give annually or quarterly and when that is the case we simply divide the amount in order to know where it lands on a per-month basis). The goal is to be at 100% in order to be fully sustainable (and to be released by our sending organization to our allocated entity, PNG). We function on these similar amounts and needs during our periodic Seconded Return Period, too (aka ‘furlough’). Obviously, without prayer none of this could happen. To that end it should “go without saying”, but we feel it is important to acknowledge it at every opportunity. Smile. What does “Divine Familial Terms” refer to, or mean exactly? Please refer to this link here, as it explains it in great, clear detail. Still have questions? Feel free to send an email to: response@sil.org. Do you recommend a good resource to keep up on daily happenings within the world of Bible Translation in PNG? Yes! Please visit The PNG Experience often to keep up with encouraging stories, videos and prayer needs here in PNG. *The JESUS Film is in over 1,460 languages today (as of October 2016). *In 2015 YouVersion currently consists of 1,472 versions in their collection of available Scripture. This collection represents 1,069 languages (speakers of many larger languages have multiple versions available; info as of 30 December, 2016). *Faith Comes By Hearing has completed audio scriptures in over 1,031 languages spoken by 6 billion people (as of December 2016). *See this video from The Seed Company (and spoken-poet David Bowden) on the history of Bible translation in an interactive and very well done short nine-minute video [November 2015]. >There are more translation programs in progress than there are translation needs. >More people who have access to Scripture than in any previous generation. >Every generation before us saw the numbers increasing as more and more languages were discovered, and more translation needs were verified. Now that trend has been reversed. *The finish line is in sight, and the last translator for the last Bible translation program is alive somewhere in the world today! *PNG is home to over 839 living languages–which figures out to over 12% of the world’s languages (from http://www.ethnologue.com/country/PG)! *Work is currently being engaged in 167 language communities. *There still remains nearly 316 languages that need ‘engagement’, a project started (lacking funding and personnel at this point). See this video to learn more! *56 languages are currently endangered (a language that is currently shifting to another language). *205 New Testament’s have been dedicated (234 total in all of PNG when combining work from other translation-based partners/organizations). *387 Media Projects completed (Media projects are Scripture, Jesus film, Luke film, AIDS, songs, Bible studies, etc.). *It is estimated that, worldwide, 50 million lives will pass away every 20 years without ever hearing or reading the Word of God in their own language. *The goal? To see a Bible translation program in progress in every language still needing one by the year 2025. The ultimate goal—God’s Word accessible to all people, so that everyone has an opportunity to have an intimate and life-changing relationship with Jesus Christ. As you can see, Papua New Guinea (the brown spot above Australia) is on the “highest” end of the spectrum and our neighbors to the west, Indonesia, are on the lowest. This is largely due to PNG importing nearly everything and its rather “out-of-the-way” travel/destination location. Indonesia, on the other hand, is within the flight path from larger locales like Sydney, AUS and Auckland, NZ and is rather “in-the-middle” of many desirable/well-traveled destinations (e.g. Thailand, Hong Kong, Singapore, Philippines, etc.). NOTE: If you click on the image it will relocate you to Movehub’s infographic site. 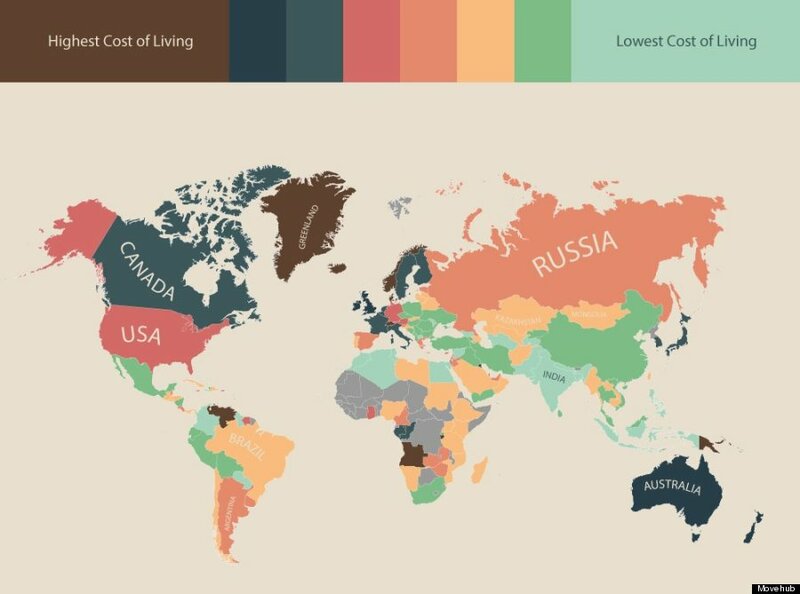 There you may see a list of 15 countries with “The Highest Cost of Living”. Number 5 is Denmark and number 6 is Australia. If they included ‘developing’ or ‘under-developed’ countries, PNG would be within that ‘Top 5’. FYI.